The year 2019 marks the thirty-ninth anniversary of the Osterweis Debate Tournament. When it was founded in 1980, the tournament aimed to introduce youth in the New Haven, Connecticut area to debate; recently Osterweis has expanded to welcome students throughout the state, and focuses mostly on the parliamentary collegiate debate style. The tournament is made possible through the generosity of Jonathan Edwards College and the Osterweis Fund. Our tournament pays tribute to the memory of Yale professor Rollin G. Osterweis (1907-1982) and his commitment to youth speech education. During his three decades at Yale, Osterweis coached the college debate team, advised the Political Union, and taught a course called The History of American Oratory, which trained students in rhetoric through the examination of historic political speeches. Both President George W. Bush and 2004 presidential contender John Kerry studied oratory with Osterweis; Kerry and Bill Buckley also debated for Osterweis’ team. The high school debate tournament was founded by Yale faculty upon the retirement of Osterweis in 1979. 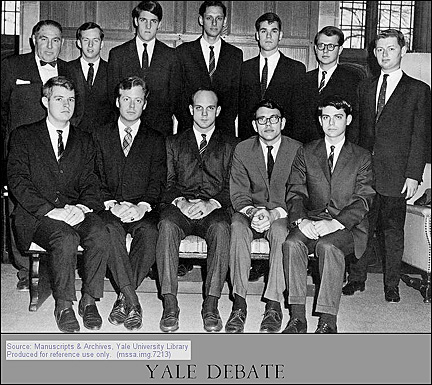 Photo: Rollin G. Osterweis, Yale's Director of Debating and Public Speaking (back row, first from left), with the Yale Debate Team, including John Forbes Kerry, Yale '66 (back row, third from left). Manuscripts & Archives, Yale University Library.